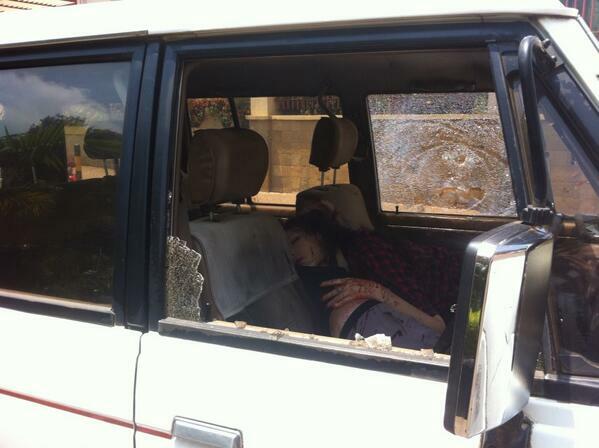 Apparently, some of the Kenyan security forces were on the side of the attackers in the Mall. "A team from the Recce General Service Unit of the Kenya Police, early in the rescue operation, made its way into the mall and secured most of it, pinning down the terrorists at one end around Nakumatt Supermarket and Barclays Bank. "However, the team pulled out after its commander was fatally shot in ‘friendly fire’ following the arrival of a KDF (army) unit. "Also pulling out at the same time was a small group of policemen from various units and armed civilians, who were the first to enter the mall from the rooftop parking and the front entrance and led hundreds of shoppers to safety." "One officer involved said that some units had a priority to locate and rescue a specific group of VIPs..."
"It also emerged on Wednesday that the police had been given advance intelligence on the planned terrorist attack, but failed to act." "Many businesses in the mall are operated by Israeli’s like the ArtCaffe owned by Alex Traitenberg." 1. Peter Ldhituachi Simani, chairman of the Political Parties Dispute Tribunal. 2. Anuj Shah of Sona Shoppe, a photography studio. 3. Harun Oyieke, a lecturer at Co-operative University College of Kenya. 4. Ruhila Adatia-Sood, a local TV and radio personality, who was married to Ketan Sood, who worked for USAid in Nairobi. 5 and 6. President Uhuru Kenyatta's nephew Mbugua Mwangi and his fiancee Rosemary Wahito. 7. Mitul Shah: A sales and marketing director. 8. Nehal Vekaria. 9. Martin Munene Kithinji: A police officer attached to GSU Recce company. 10. Wilkista Vizengwa Angoro 11. Crispal Gaitung'u Ng'ang'a: of Genesis Office Solutions 12 - 14. Kennedy Mogaka Mochere, Veronicah Wairimu Kamau, and John Mutando Musango : employees of Nakumatt. GHANA 17.Kofi Awoonor: a renowned poet. INDIA 18. Sridhar Natarajan: working for a pharmaceutical firm. 19. Paramshu Jain: The eight-year-old son of a branch manager for the Bank of Baroda. PERU 20. Juan Jesus Ortiz: A doctor. Simon Belcher, from Scotland, survived. AUSTRALIA AND HOLLAND 22 and 23. A 33-year-old Dutch woman and her Australian husband. 24 and 25. Australian Ross Langdon, of Regional Associates Ltd, and his wife from Holland, Elif Yavuz, a malaria specialist. CHINA 26. A 38-year-old Chinese woman. FRANCE 27. A mother and daughter. 30 and 31. Other victims identified by Daily Telegragh are Zahara Bawa and her eight-year-old daughter Jenah.
" FRANCE 27. A mother and daughter." So which is the 27th "victim"? The mother or daughter? See Blog of Blogs for more. Great coverage Aang, BTW they're playing games with this Alex Traitenberg's name. Yesterday it was reported his name is Alex Tachenberg, then today I discovered it is Alex Trajtenberg. Background information is sparse and sanitised on-line, but he is an Israeli national affiliated with an enigmatic Sony Holdings, Ltd. operating out of Kenya. More on this and a blockbuster revelation here: Kenya's Westgate Mall False Flag Apologies in advance for any unintentional informational overlap as I drafted my post on this on the 26th and posted just today. This is a bank robbery in Guangzhou. Stop printing lies!! That first picture is over 3 years old and has been used countless times. Save image and google - image search. It has been traced back to the FBI website dated April 10 2010. Now why is the media showing you a 3 year old photo and saying it was from this incident when it clearly isn’t? Now lets see if the DM allows this comment. Sorry, typo. It’s from april "16" 2010 on fbi website. It has been used countless times in various media stories. That photo is not from Westgate it’s from a bank robbery in china guangzhou. Nice reporting DM. Just googled as suggested by a DM reader and this is a bank robbery in Guangzhou, not Al Shabaab! !How can we believe anything we read in the media when they lie without any impunity?!! more elite soldiers who just happened to be around and randomly given weapons by two anonymous asian men.